(1963) How My Heart Sings! How My Heart Sings! 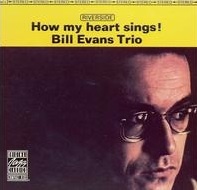 is an album recorded by jazz musician Bill Evans in 1962, at the same time as Moon Beams. It was reissued in 1992 with one bonus track. How My Heart Sings! and Moon Beams were also released combined as the double album The Second Trio. Writing for Allmusic, music critic Thom Jurek wrote of the album "This is a tough recording; it flies in the face of the conventions Evans himself has set, and yet retrains the deep, nearly profound lyricism that was the pianist's trademark." On All About Jazz C. Michael Bailey said "After the ballad-laden Moon Beams, producer Orrin Keepnews wanted a slightly more up-tempo recording that resulted in How My Heart Sings. Fifty years later, the recording remains painfully introspective, up-tempo or not. Evans was the Van Gogh of jazz: sensile and troubled, characteristics that expressed themselves in his playing his entire career". ^ a b Jurek, Tom. "How My Heart Sings! > Review". Allmusic. Retrieved June 28, 2011.